With that in mind, let's take a look at one way in which fans using the Internet could offer something fundamentally positive to Formula 1 racing teams. 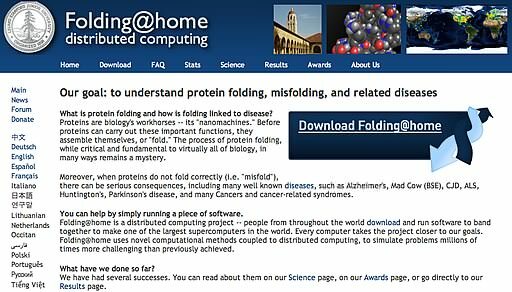 Folding@Home is a distributed computing project run by Stanford University. You've probably come across it in the past, you may even be running it on your PC or Playstation 3 right now. The concept is a simple one - harness the power of idle computer processors around the world in order to solve computationally intensive problems. What does this have to do with Formula 1 you ask? Well, Stanford University sees distributed computing as a better alternative to using a supercomputer. Most F1 teams these days employ some kind of supercomputer to solve problems (usually to calculate the performance of new aero parts), so why not leverage the power of our idle machines to help push a team further up the grid? The Internet that Ron Dennis finds so abhorrent could actually be of benefit to him. No longer would budget and sponsorship be the only dictator in how much power each team has at its disposal, rather how good they are at recruiting their fan base to assist the cause. There are additional eco-benefits in not having to run power hungry supercomputers too, which should please Max and the FIA no end. It seems like a win-win situation for everybody. Fans could tangibly contribute to the success of their favourite team at the same time as reducing their costs. So there you have it, just one simple way that the Internet can help rather than hinder Formula 1. It's not a new idea in any sense, merely applying a proven concept to a new market. More information on Folding@Home can be found at folding.stanford.edu.